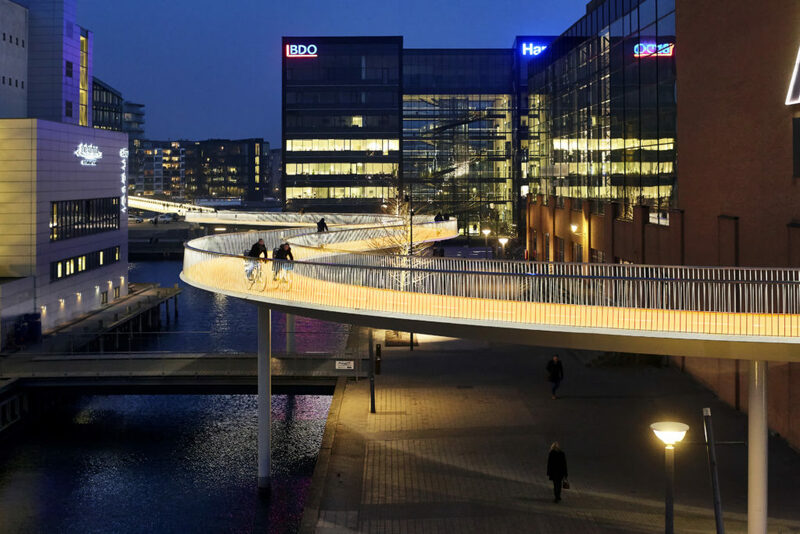 Urban lighting in Greater Copenhagen. Only one fifth of all public lighting in the region is currently LED-based, giving Green economy a huge potential in bringing cities and regions together for setting common framework before making the planned major investments. As cities and regions around the globe plan how to replace their old lighting infrastructure with LED, many will feel overwhelmed by the increasingly complex task at hand. Lighting Metropolis’ latest initiative, Green Economy, brings together 14 cities, Region Skåne and universities in Greater Copenhagen, to create a common framework for everything from procurement contracts and business models to technical specifications, lighting quality and indoor climate. The overall aim of Green Economy is to save s to save 7,200,000 kWh annually in energy , by investing in large-scale LED-replacement schemes. The figure corresponds with the electricity consumption of 1800 average Scandinavian households. But the goals of hte initiative are much more far-reaching, and will also weigh in better light quality, better indoor climate, increased safety, durable solutions with a long service life and low operating costs, as well as the incorporation of light with the other functionalities of the urban space and public buildings. Central to the project is providing help to the municipal and regional partners to achieve their individual goals of LED-replacement in buildings and on roads through establishing the common framework for the planned major investments. The help consists of common tools, individual consultancy assistance and competence development. To achieve this, Green Economy partners plan to use external consultants to an estimated value of EUR 1.3 million (DKK 9.6 million) during the three-year project period. Therefore, a formal EU tender of the services will be carried out during hte Spring and Summer of 2019. The EU tender will be implemented as an offer of framework agreements for all partners, so that individual consultation for the partners can then be easily requested. The consultants will be required to have experience of both indoor and outdoor lighting, as well as being able to draw experience from both Denmark and Sweden. In addition to councelling, a set of common tools will also be part of the requirement, with sparring from a dedicated advisory panel, set up by the project. Cutting edge research knowledge from the universities will also be an important part of the toolkit – which will be available to everyone via this portal. Up-to-date guidelines the optimal processes for municipalities, regions and other actors’ preparation for the replacement of lighting in public buildings and road lighting. Knowledge about off-the-grid lamps (solar lamps). This knowledge can be used by the municipalities to decide on where such lamps can advantageously be established, for example; because the transmission of power cables is expensive and difficult. Developing general specification requirements, that can be included in the supply of indoor lighting, road lighting and other lighting., including specifications for energy efficiency, quality, health lighting, color, brightness, flicker, control, environmental conditions / circular aspects, data-based solutions etc. The new paradigms aim to make it easier to carry out the supply of lighting projects, and particular focus will be on energy efficiency and quality, including additional benefits in the form of health lights, or light which contributes to greater safety. The work includes new combinations with intelligent management, other digital solutions, new business models and operating arrangements, all of which can help to increase energy savings. New business models are continuosly launched on the market from lighting companies, energy companies and investors – Green Economy will examine which of the various business models for lighting that promote energy efficiency and circular economy. There are models such as leasing, circular purchasing, pay-per-lumen, ESCO etc. Experiences and key figures will also be presented, that illustrate whether greater energy savings can be obtained through various forms of how the lighting operations are organised. Often, external companies are responsible for the operation of road lighting systems. Consultants will also examine whether a basis can be created for driving road lighting systems more energy-efficiently through economies of scale and the consolidation of competencies, but, importantly – without allowing the competencies to disappeare from the municipalities, in a time when the lighting becomes part of the digital infrastructure. The results will be published on LightingMetropolis.com before the end of the project, in 2021. To stay up to date with the developments, please check out our news section.